Have you ever wanted to be a celebrity? When I was a kid I thought it would be so cool to be a movie star or a model and have everybody know my name. As I got older, though, I realized that having everyone know my name would also mean being followed everywhere by people with cameras who recorded my every move. I realized how hard it would be to do normal, everyday things and decided that being a celebrity didn't sound nearly as interesting anymore. Jesus was a celebrity in His day. Wherever He went, crowds of people would appear to listen to Him teach, to be healed of all kinds of diseases and even just to watch Him. The religious leaders seemed to be often present as well, but they were there to watch for mistakes and for ways they could discredit Him. Just look at the opening of Mark, chapter 2: "When Jesus returned to Capernaum several days later, the news spread quickly that he was back home. Soon the house where he was staying was so packed with visitors that there was no more room, even outside the door." Just imagine a house so packed that people were crowding around the door hoping to get in. Into this crowd come five men. "While he was preaching God’s word to them, four men arrived carrying a paralyzed man on a mat" (vv.2,3). More people hoping to get close to Jesus and get help for their friend, only to find the way is completely blocked. There wasn't room for even one man to squeeze through the crowd, let alone for four of them carrying another man on a mat. When I taught this story in children's church a few weeks ago, one of the kids was confused by the word 'mat' so I told him it was like a stretcher. Picture four men, each holding the corner of a stretcher and that's the amount of space they needed to get through the crowd. There wasn't anywhere near that much space available! The four men weren't about to give up, though. They believed that if they could just get access to Jesus, if they could get close enough to get His attention, then their friend could be healed. Since they were unable to get through the door, "they dug a hole through the roof above his head. Then they lowered the man on his mat, right down in front of Jesus" (v.4). Once again, the Bible's lack of details makes this seem like it took only a second or two, but I'm guessing this was a fair bit of work for them. Even though roofs in that time were dirt and thatch, rather than wood and shingles, I still think it took them a while to dig a hole big enough for the mat they wanted to lower down. It was big enough for a man to lie on, remember, so it would need to be a big hole. Did people try to stop them? It would have made noise, after all, and probably sent clumps of dirt down into the room below them. Whoever owned the house probably wasn't keen on having a huge hole in his roof. Regardless of how much time and effort it took, or who tried to stop them, the four men persevered and brought their friend to Jesus, who did forgive his sins and heal him. It's not actually Jesus' part in this story that interests me right now, though. What strikes me about this story is how hard those four men had to work to bring their friend to Jesus. Even before they had to dig a hole through a roof to get access to Jesus, they also had to carry their friend to that house. Who knows how far they carried him? It could have been from only a few houses over or it could have been an hour's walk or more. We don't know. If you're like me, then you know and love people who are sick. People who are hurting in some way. People who need access to Jesus. Thankfully, we don't have to carry them through the streets to bring them to Jesus. Nor do we have to dig a hole through the roof because the crowd keeps us too far away for Jesus to see the need. Jesus promised us, "I am with you always, even to the end of the age” (Matthew 28:20). We don't have to travel to Him or push through a crowd of people blocking our way. Jesus is simply with us at all times. Unlike those four friends, we have easy access to Him. When we have a need, or when someone we love has a need, Jesus tells us "You can ask for anything in my name, and I will do it, so that the Son can bring glory to the Father. Yes, ask me for anything in my name, and I will do it!" (John 14:13,14). Unlike those four men struggling to bring their friend to Jesus, we can bring any need we have to Him at any moment. 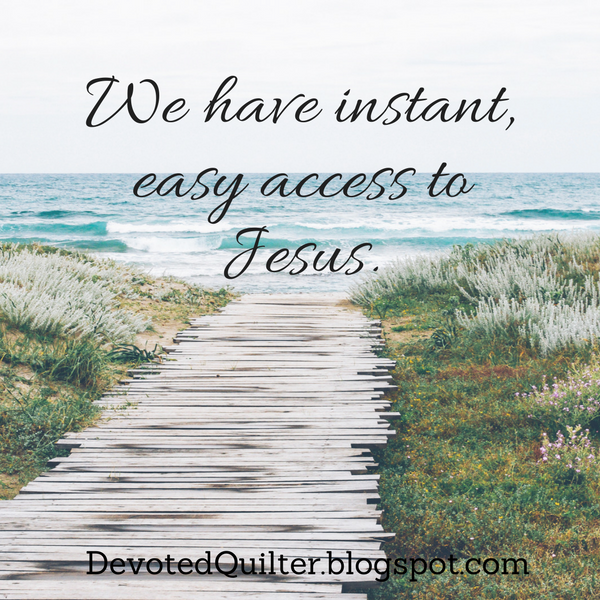 We have instant, easy access to Him whenever we want, through prayer. The question is, are we making use of it? Are we going to Him in prayer regularly, bringing Him the needs we see around us? Sometimes being able to do something easily, whenever we want, means we hardly ever do it. Are we doing that with prayer too? Or are we determined, like those four friends, bringing every need we can to Jesus?